U.S. special representative on North Korea Stephen Biegun, center, speaks to reporters as his South Korean counterpart Lee Do-hoon, right, looks on after their "working group" meeting handling North Korean issues at the Foreign Ministry in Seoul on Dec. The U.S. has made only limited progress with North Korea on nuclear talks, Washington's North Korea envoy Stephen Biegun acknowledged Thursday. "While we would want to be much farther along than we currently are, we have made some progress over the last six months, with expectations of much more to come," Biegun said in a speech at Stanford University. The comments come just weeks ahead of an anticipated second summit between U.S. President Donald Trump and North Korean leader Kim Jong Un. The date and location for the summit will be announced "early next week," Trump said Thursday. "I think most of you know where the location is. I don't think it's any great secret," Trump said. 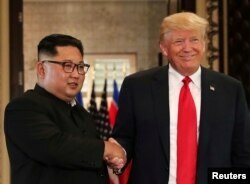 It has been widely reported Vietnam will host the second Trump-Kim summit, set to take place near the end of February. Thailand also has been mentioned as a possibility. The U.S.-North Korean talks have moved slowly since the first Trump-Kim meeting last June in Singapore. During that summit, Trump and Kim agreed to "work toward complete denuclearization of the Korean peninsula." But the two sides have failed to agree on what that means, and how or when it will be carried out. Those difficulties were underscored earlier this week, when a U.S. intelligence report said North Korea is "unlikely to completely give up its nuclear weapons and production capabilities." Biegun suggested that intel report was taken out of context by the media, and rejected notions the Trump administration is naïve for engaging with Pyongyang. "It's not that we're being deceived. It's not that we don't know what's going on. It's not that we don't take the threat with the gravity it requires," he said. If diplomacy doesn't work, the U.S. has unspecified "contingencies," he added. Biegun said Trump expects his next meeting with Kim to result in "significant and verifiable progress on denuclearization — actions that are bold and real." The envoy, a former Ford Motor Company executive, is headed to Seoul on Sunday for talks with South Korean officials. But it's not clear exactly how the deadlocked nuclear talks can advance. The Trump administration had long insisted that Pyongyang must completely dismantle its nuclear program before it lifts any sanctions on the North. Recently, U.S. officials have signaled more flexibility. The U.S. does not expect North Korea to "[do] everything first," Biegun said. Instead, he said he hopes both sides can take actions that are "mutually reinforcing." But before the process of denuclearization can be final, Biegun said the U.S. must receive a "comprehensive declaration" that provides a "complete understanding of the full extent of the North Korean [weapons of mass destruction] and missile programs." "We must reach agreement on expert access and monitoring mechanisms of key sites to international standards, and ultimately ensure the removal or destruction of stockpiles of fissile material, weapons, missiles, launchers and other weapons of mass destruction," Biegun said. Besides sanctions relief, North Korea also is seeking a formal declaration to the end of the 1950s Korean War. For its part, North Korea has for more than a year held back on provocative missile or nuclear tests. It is not clear what else North Korea is prepared to offer. In recent weeks, Kim has raised the possibility of closing the Yongbyon nuclear facility, the country's major nuclear plant, if Washington takes "corresponding measures." Biegun says he will discuss those "corresponding measures" during his next set of meetings. In this file photo taken on June 29, 2018, US soldiers salute during a grand opening ceremony of the new headquarters building for the United Nations Command and US Forces Korea at Camp Humphreys in Pyeongtaek. 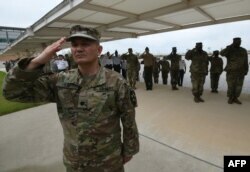 But one option not being discussed, he said, is the removal of U.S. troops from the Korean peninsula. Trump has long expressed displeasure about the presence of 28,500 U.S. troops in South Korea, and says Seoul isn't paying enough for the troop deployment. The U.S. and South Korea are currently deadlocked over the renewal of a cost-sharing deal for the U.S. troops, which expired at the end of 2018.